Embark and enjoy unforgettable fishing! Huge sea areas, that we know perfectly, ideal for multi-fisheries! We provide high quality service and a serious organization. We use all the techniques of modern fisheries : JIGGING - TROLLING - BAIT DRIFT. The HAWKINS bank in particular is "The Fishing SPOT" not to be missed for fishermen in search of record fish! For two seasons, we are the only ones to take sport fishermen and it is a fishing zone that we particularly love. 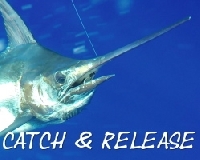 CATCH & RELEASE is practiced as much as possible on all fish rostrums, trevally and doggies. We respect this ethic that is dear to us. Rodrigues Island, Land of fishing records. Specialized Press and pros Angling recommand us (see Contact page and reservation) and it's not for nothing! Professionals, we guide you and share our knowledge of various fishing techniques in the Indian Ocean, always with friendliness, good humor and above all a passion for fishing. And thanks to its technology, its specific design and performance, L'oiseau des îles ll provides accessibility to major offshore banks at all! With friends or family, beginners or experienced fishermen, Rodrigues is an Indian Ocean gem that offers enthusiasts, the beautiful sport fishing spots, "fighting" incredible and excitement through stunning species inhabiting its waters. Follow us throughout the season, in pictures and videos on my Facebook page, my Youtube channel and Instagram.